Our pets mean so much to us and are a part of our families. Whether you’re going on vacation or working long hours, you want to make sure your pets are taken care of while you’re gone. There are basically three options: Take them to a boarding facility, have a neighbor or friend take care of them, or hire a professional pet sitting company. Friends or neighbors might be a good option, but what if they can’t help this time or you feel guilty asking them all the time? If you’re having any of these challenges, choosing an in-home pet sitter is the best option for pet parents. Calling All Dogs has been in business since 2004. Many of our customers and dog walkers have been with us for years. Recently, CAD has modernized their methods of communication with mobile software, while still providing the good old fashion notes to customers. With time and experience comes many happy customers, extended service times, various pricing options, a wider location range, and a dedicated team always ready to take care of your pet! 2. Are you licensed, bonded, and insured? This is an important question to ask any pet sitter coming into your home. Since pet sitting is not a heavily regulated field, individuals might take advantage or create false histories. Most one-person pet sitting businesses might not be licensed and insured. If you place your trust in a company, you need to know that all the sitters are bonded and insured. Employing responsible and dedicated walkers is something Calling All Dogs takes very serious. We also run extensive background checks and check character references. 3. What is your backup plan? How many sitters work with you? Hiring an individual pet sitter will likely mean they are the only person who will be available to care for your pet. Accidents happen. What if your sitter gets a flat tie, falls ill, or they simply forget? You don't want to be left without a good backup plan. 4. Can you provide references? Prior to hiring a pet sitter, you’ll want to address if they have any references from previous jobs and employers. Having good references is a strong leg up for a pet-sitting candidate because it shows dedication to their job. Pet sitters with a solid and positive work history are more likely to provide the better individualized care and attention that your pet needs. 5. Do you have any reviews or testimonials? It’s always a good idea to check out reviews and testimonials for any potential dog walking service you are using. Reviews are always a good way to see how a company treats its customers and investigate the quality of their pet sitters. It might be hard to find this information on an individual pet sitter and even harder on someone referenced to you by a family member. Calling All Dogs is an established pet sitting company, so please check out our reviews on: Yelp, Google, and Facebook ! You might feel uncertain about when you can contact an individual pet sitter and some aren't even open for service on weekends. With an established pet sitting company, the Hours of Operation are clearly listed on their website. At Calling All Dogs, you can reach the office seven days a week from 8:30am-7pm. During that time calls are returned, appointments can be booked, and all questions can be answered. Dog walking and pet sitting service times from 7am-10pm seven days a week. 7. 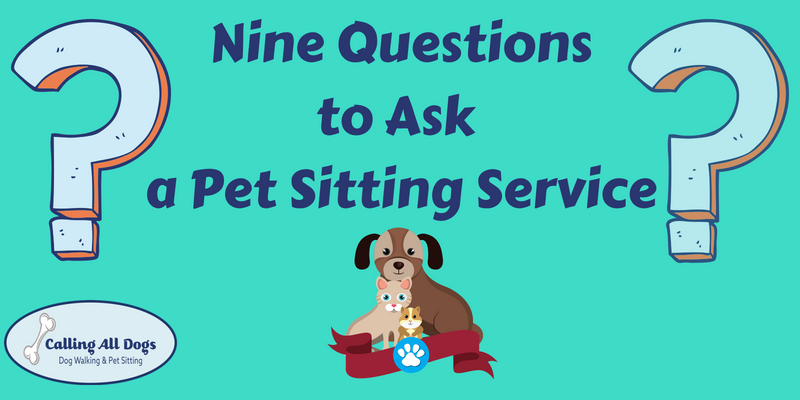 What types of pet sitting services do you provide? Just like everything in life, your needs change when it comes to pet sitting or dog walking. What if an unexpected emergency comes up and you need to leave town? You might need someone to spend the night at your home or have your dog stay overnight somewhere else. Some companies don’t provide full service pet care, such as weekend visits or overnight care options. Calling All Dogs offers several options seven days a week: In home Pet Care, Doggy Sleepovers, and Overnights. We also have a few former Vet Techs on staff in case your fur baby has special medical needs. 8. Are there any extra fees or charges? No one likes surprise fees. Some dog walking companies charge extra for weekend or late-night visits. A few pet sitting companies even charge you for a 2nd pet to care for or drive time should you live too far away. At CAD, all additional fees and charges are straight forward and listed ahead of time. We provide service 7 days a week up, until 10pm, with no extra charge for nighttime pet sitting or dog walking. There is a Holiday surcharge($5 each visit) and we charge $2 extra if you have 3 or more dogs. Otherwise, what you see is what you get. And, with the referral program, you can even earn free visits! Every new customer you refer, you receive a $20 credit to your account! 9. How do you know if your sitter actually goes to your home and completes the visit? When you hire an individual to watch your dog you will have to trust that they go to the appointment and properly care for your pet. We have heard horror stories of it the actually even go to your home and take your dog out for a walk. You might get a note or a text if you're lucky. When you choose Calling All Dogs, we are a pet sitting company that utilizes professional pet sitting software with a mobile app. You will have hard evidence that your dog walker fulfilled their visit promise. After each completed pet visit, you will receive an email with a GPS time-stamped journal, complete with pictures and a thorough note of how your fur baby is doing. We have management on the clock seven days a week to hold our team accountable. They will ensure all visits are completed in a timely manner and handle any problems that may arise before or during your pet visit. Pet Care companies have grown exponentially over the years and more are popping up all the time. You can find almost any service you need, but when researching what’s best for your pet, don’t pick the first company you find. They all offer different services and experiences. We hope these questions will be helpful in finding the company that works best for your pet and their needs. 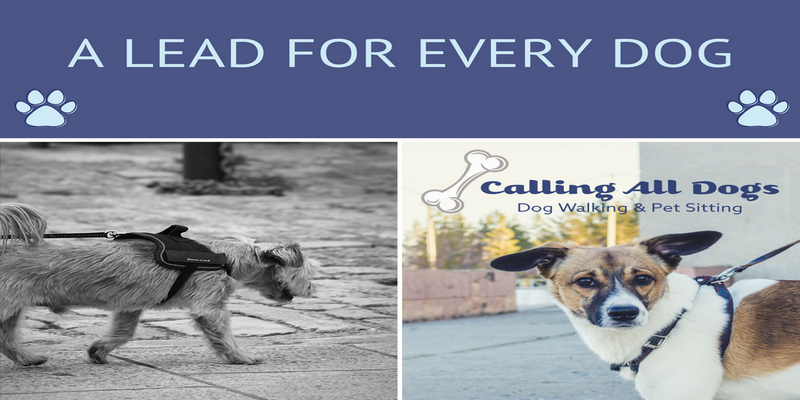 Calling All Dogs is a premier dog walking and pet sitting that proudly serves all areas of St Pete and surrounding areas that include: DTSP, St Pete Beach, Tierra Verde, Treasure Island, Gulfport, Madeira Beach, Seminole, Pinellas Park, and Feather Sound. If you have any other questions or want to learn more about our dog walking or pet sitting services, contact us today! You have decided you need a dog walker or pet sitter which can be a daunting task. You establish some form of simple communication, maybe your friend or sitter leaves a note or sends a text, but how do you know they were there? You might have trouble getting visits at the exact times you and your pet are accustomed to or have trouble finding last-minute sitters. You agree to pay them, but which method? How long will they be there, and will they actually stay the allotted time? Will you get a thorough update or a simple and unsatisfying text?. You will never have to worry about those things if you hiring a dog walking company that uses professional pet sitting software. 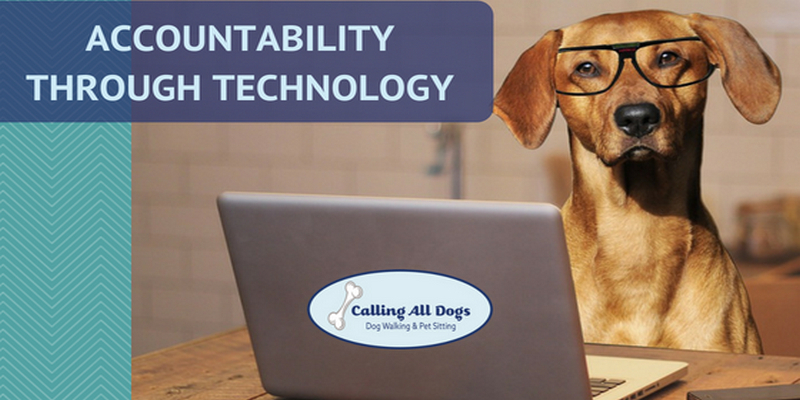 At Calling All Dogs, we use the Precise Pet Care software, which is also available as a mobile app. With so many convenient features you will never want to go back to a simple handwritten note! Personalized Profiles - As a new client, you will get a profile. This is where your address, pets, any codes, and even cleaning supply locations will be listed. Each of your pets will also get their own profile, with a picture and a list of their special needs, feeding times, breed and age. 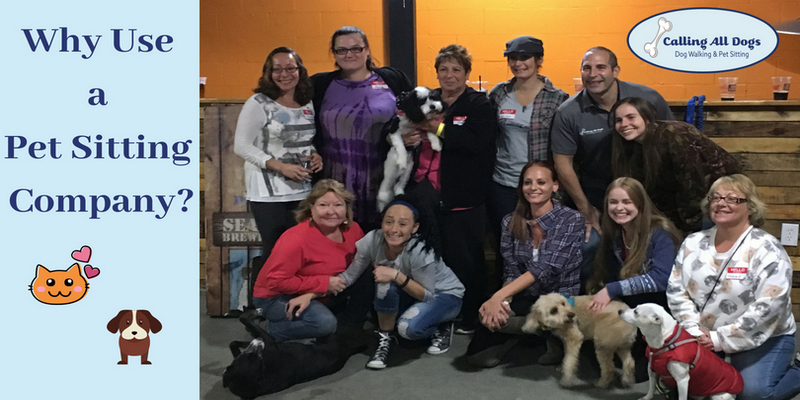 The Calling All Dog’s team will input the details you’ve given them before and during the meet and greet, then send you an invitation to confirm and link your profile. You will then be able to edit you or your pet’s info at any time. Scheduling - Under My Schedule, you can request and cancel appointments at any time. You can add any notes or special instructions here too. And with the Ongoing Schedule Lookahead, you can book reoccurring appointments automatically. iCal Feeds - With iCal Feeds, you can sync all your scheduling with Google Calendar, Mac Calendar, Outlook or any other calendar app you prefer. Easy Invoicing & Billing - You can add your credit card for quick payments. Here you can also access a detailed list of your invoices and transactions. GPS Tracking - You will be able to see your walker’s exact route with the GPS tracking map attached to every journal. Time Stamp - The journals are also time-stamped, so you know exactly when your walker arrives and when they leave the visit. Report Card - The report card will give you an idea of the basics of the visit, such as whether or not your dog peed, if medicine was given, if the water was refreshed, or if cat litter was scooped. Pictures - Each journal will have pictures of your pets. What better way to stay connected with your pet when you're not home? It will put a smile on your face to see theirs. These pictures also show up on the timeline on your Dashboard and collectively in the gallery under My Photos. Personal Note from Sitter - The journals are completed with a personal note from your sitter, letting you know how things went. You can reply to the note, allowing you and your sitter to communicate through each journal. By utilizing all of the aforementioned technology found in Precise Pet Care, you will have hard evidence that your walker was there on time and performed all of the requested tasks. The Journals are sent to the company as well. So, you, the software, and the office will be monitoring your appointments to be sure your walker is doing their job properly. So, instead of rolling the dice with uncertainty, consider hiring a company that uses pet sitting software. Calling All Dogs is a professional dog walking and pet sitting service. We proudly serve all areas in: St Pete, St Pete Beach, Tierra Verde, Treasure Island, Gulfport, Madeira Beach, Seminole, Pinellas Park, and Feather Sound. If you have any other questions or want to learn more about our dog walking and pet sitting services, Contact us today! If you live above areas and are in need of a dog walker or pet sitter, we’ve got you covered! Contact Calling All Dogs today! Picking a leash for your dog may seem easy, but having a good leash to fit your dog's specific needs can make a great difference! Leashes are not only great for training and building a language between you and your pet, it is also an important safety tool that will keep you, your pet and others around you protected. The most important things to consider when purchasing a lead for your pet are leash length and material. To find the lead that's most appropriate for your dog you should also consider how experienced your pup is on a leash and what you’ll be using the leash for. 4 Feet - A four-foot leash is great for events, crowded areas or new experiences. The short length makes it easier to control and keep your dog by your side in high-traffic areas. 6 Feet - A six-foot leash would be better for a daily walk so your pooch has some room to roam and explore their surroundings without risk of getting tangled. 8-10 Feet - Longer leashes are a great way to practice obedience training. The long length allows a distance between you and your pet while still allowing control over them. Consider the Width.If your dog likes to chew their lead or pull, be sure to choose a thicker leash. For a smaller breed or a puppy, consider a thin lead that will be lighter making it easier for them to move about. Nylon - This very popular material is a cost-effective and weather resistant. Unfortunately, basic, flat, nylon leashes break fairly easy, are often effortless for Fido to chew, and aren’t as comfortable to operate. Imagine your dog spots a squirrel and dashes after it, your reaction might be to grab the leash. A nylon lead could leave you with a nasty burn or worse yet, the leash could break. Leather - A sturdy leather leash is a great alternative to the basic nylon lead. While being more pricey, they are also more durable, very comfortable and much safer to handle. Chain - Chain leashes are often recommended for tenacious chewers. But sometimes, chain leads can be heavy or uncomfortable. A retractable leash might seem like a fun option for more length, but they can be very dangerous and cause serious injuries. The greater the distance between the walker and the dog, the less control the human has over the animal. If your dog decides to bolt after a squirrel the lengthy cord can easily snap or the stopping mechanism might malfunction. If you grab the cord it can leave burns, if the cord is caught on the dog's leg it can lead to a horrifying injury. Retractable leashes are popular, but should only be used by experienced handlers and dogs who are well trained on a leash. Kong Traffic Leash. The leash has two position handles, the additional one near the base of the leash where it latches onto the collar. The handles are padded so it is soft and easy to hold in case of any sudden stops. The handle near the base of the leash allows you to train your dog to walk beside you and is very useful in large cities where they must learn to stop with foot traffic. The Kong Traffic Leash is also made of reflective material so you and your pooch are easy to spot on your nightly walk. Click Here for more info. Outdoor Bungee Dog Leash. It is a unique design made out of the same bungee cords that people use to jump off of bridges and cliffs. The cord is only 36.5 inches long but can extend to 4 feet, which makes it like a manual retractable leash. It is designed for medium to large dogs and has two positioned padded handles making it an excellent training leash. Click Here for more info. The Lupine Leash might work best for you. Lupine Leashes are made out of heavy-duty hiking gear materials, and LupinePet has an “Even if Chewed” Guarantee, where they will replace any chewed leash with no questions asked. Click Here for more info. The Strong Chew Resistant Reflective Dog Training Leash by GOMA Industries is also a good leash to try with your chewer. Complete with a padded handle, the lightweight, yet very strong rope is often used by mountain climbers. And the cord is embedded with reflective materials so the leash glows in low light, making it perfect for night walks. Click Here for more info. Thunder Leashes have a special clasp. You can use the leash like a regular lead, or you can readjust the leash into the special clasp for a “No-Pull Solution”. In this position, the leash wraps around the dog's torso and applies pressure when it pulls. ThunderLeash also has a money back guarantee if it does not work for you and your pup! Click Here for more info. Mountain Climbing Rope Leash by Phydeaux’s Pet Supply is another great option. This leash has been tested to withstand 1000 pounds of pulling force. The extra durable and thick mountain climbing rope can be used for extra large breeds and also comes with a padded handle. Click Here for more info. When your dog is properly trained on a good leash, taking them on a stroll is a wonderful experience for you and your dog walker. You increase the chances of successfully training your pup by by carefully considering the length, width, and material of their lead. You can always ask your pet sitter what they prefer or think would work best for your dog after they have gotten to know them. Why Use a Dog Walking and Pet Sitting Company? There are many benefits of hiring a company to take care of your pet sitting needs. While you may rely on Sally down the street to babysit your dog now and then, Calling All Dogs is equipped with plenty of pet sitters with price ranges to fit any budget. Insured & Bonded. You never know when accidents happen. Our team of bonded and insured pet sitters care for your pet as if they were our own. Peace Of Mind. During your complimentary meet and greet, you will be introduced to your primary walker, whom you and your dog will build a relationship with. If your primary walker is busy or unavailable, you will have a secondary walker to be sure your pup is never without their walks! Reliable and Flexible Options. We service the entire St Pete area seven days a week, including holidays. We can do dog walks or pet sitting for any amount of time you need. If you’re away on vacation, we can stop by morning, noon, and night. Or you can utilize our Doggy Sleepovers, where your pet stays at one of our sitters homes or Overnight Pet Sitting, where our sitter spends the night in your home. We also have a Pet Taxi service, where one of our sitters will transport your pet to the groomer, vet or day care. Accountable. We use the Precise Petcare app to keep you connected to your sitter and get updates on your pet. After every visit, your walker will send you a time stamped journal which includes a GPS map of the walk, the basics, and pictures! With so many options, using a company that is so dedicated to keeping their clients covered and their furry friends happy is the obvious choice! Calling All Dogs is a premier dog walking and pet sitting that proudly serves all areas of St Pete and surrounding areas that include: DTSP, St Pete Beach, Gulfport, Tierra Verde, Treasure Island, Gulfport, Madeira Beach, Seminole, Pinellas Park, and Feather Sound.